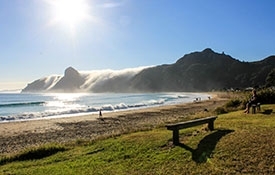 You may not want to leave Taupo Bay, but if you do there are lots of options including joining a bus tour to Cape Reinga, the very tip of New Zealand, with sand duning, exploring remote beaches, and learning about the area from experienced guides which will be a highlight of your visit. A 20-minute drive north from Taupo Bay takes you to Historic Mangonui and Doubtless Bay. Try the fish and chips at Mangonui's legendary fish and chip shop overlooking the harbour, or have a drink and a meal at one of the many eateries both offering historic and modern venue options. A 20-minute drive south will take you to Totara North, where from Campbell Road, one of the many DOC walks in the area begins. The walk takes you through native bush, fording streams, to a DOC hut then up to the Duck's Nose where a wonderful panoramic view of the Whangaroa Harbour and surrounds will take your breath away. Please note this track is not suitable after heavy or persistent rain, and check on the DOC website for any closures or repairs to the chain rope. Want something more sedate? Walk up to Rangikapiti Pa where you will be reward you with a view overlooking Mangonui Harbour. Mangonui Harbour and the whole of Doubtless Bay to the North and Whangaroa Harbour with beautiful Bays to the South – there are plenty of attractions, walks, fishing, golf courses and good food and beverages to try on the East Coast of Northland. 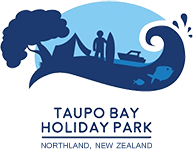 Why not book your next visit with us at Taupo Bay, a great base off the beaten track to explore this amazing area? One Hour North: Kaitaia, Ahipara, Shipwreck Bay and 90 Mile Beach. One Hour South: The Bay of Islands – Kerikeri, Waitangi, Russell and Paihia. Surf's up, no board? 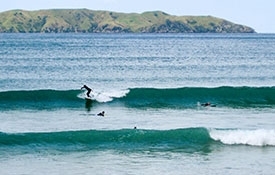 Surfboards, boogie boards, and standup paddle boards are all available for hire at the Taupo Bay Holiday Park. Want to catch some kaimoana? Snorkel gear is also available for exploring the area. Want to learn to surf or need a refresher? Contact O'Neil Surf Academy. There is no better way to explore the bay than in a sea kayak, or if you are brave enough, why not enter some of the seaside caves. 3 single kayaks and a double kayak are available for hire at the Taupo Bay Holiday Park. 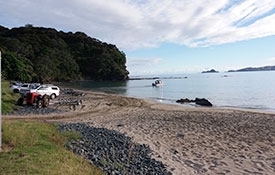 Fish off the beach or rocks of Taupo Bay, a simply great way to spend the day or bring your own boat and launch from the beach ramp at Taupo Bay or from the concrete ramps at the Mangonui or Whangaroa harbours. Be sure to bring your catch back to clean at our fish cleaning area, and wash the boat down at the layby in the Hoilday Park. 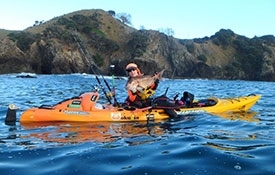 Fishing charters available from Doubtless Bay or the Whangaroa area. Tour bookings (Cape Reinga, whaling museum, fishing charters, etc). We have a shop for your basic needs. Barista made coffee is available during the summer months, takeaways and a lunch menu are also available during the busy season. We have bait, ice and basic fishing tackle available year round for those fantastic winter fishing trips.